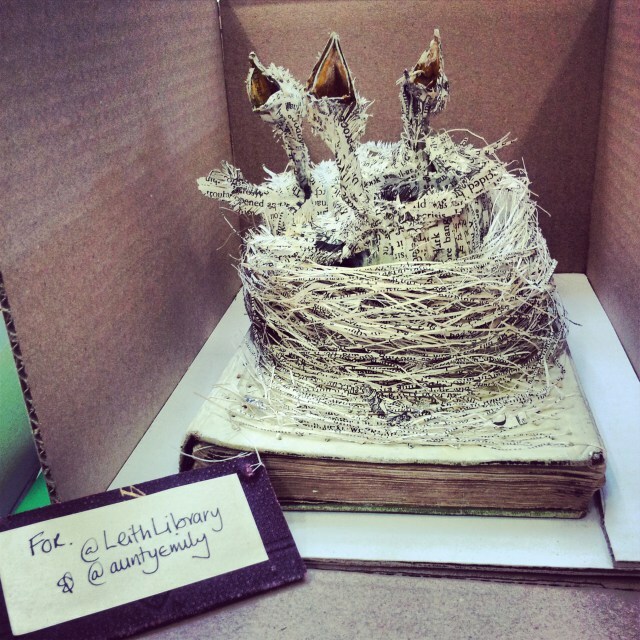 The Edinburgh Reporter loves the story of the mystery book sculptures. It is so wonderful that even in these times of social media, photos and instant sharing of news that there is someone in Edinburgh who makes these beautiful sculptures, but manages to remain anonymous. The sculptures have given so many people so much pleasure, and are not just works of art in the decorative sense, they have much more intellectual depth to them. This is clearly the work of someone who really loves books and knows all about them. Emily Dodd, the Reader in residence at Leith Library is another booklover. She seems to be the target for the newest sculpture as she was mentioned on the tag left with the bird’s nest. “Scottish Book Trust is delighted that one of our Readers in Residence has received one of these amazing homages to literature. Emily puts her heart and soul into delivering innovative projects around reading at Leith Library, and as such she is a truly worthy beneficiary of one of these unique creations, inspired as they are by a love of books, reading, and libraries. When we were working away in the Press Yurt last year at the Book Festival there were a few unexpected deliveries from the mystery sculptor which caused a great stir and excitement… Here is a photo we took….